Yes, that's the one! My son and daughter-in-law live near there, so depending on my schedule, I may try to make it again this year. There was a ton of food and a fun atmosphere at the end. I don't drink Gatorade (doesn't agree with me), so I didn't know about it being half-strength. A secret finisher premium this year, huh...I'm a little intrigued. I occasionally go to the Adirondaks so I found the HM you mentioned in Lake George. It is called the Annual Camp Chingachgook Challenge and is still just $30. Good deal! Not really on-topic, but one of the Jeopardy contestants this week mentioned that she had run the Half and Half. I knew all about it from reading your recap a while ago, so it was interesting to see. As far as small half marathons, I did one in Lake George a couple of years ago where they made all the medals from wood. $30 registration fee included a shirt and quite a wide variety of food post-race. It was a nice one...I may look into it again this year. I think that there were just under 250 runners in the half. There was also a 10K (or maybe it was a 5K) at the same time. Time for another attempt at playing statistician. 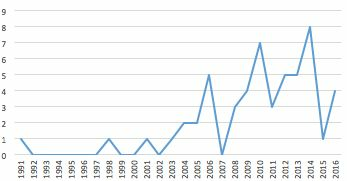 Here is a chart I made of the HMs near me and the year they began. 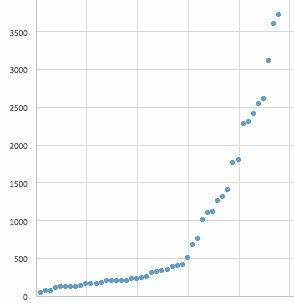 Don't know what to make of the "staircase" phenomenon in the graph. But what is startling is that another *four* HMs sprang into existence just this year! All four are trail HMs. None are particularly cheap so I'm not sure what the attraction is given that we have a number of trail HMs already. Oh, one thing missing from the graph: There is a HM (not shown) founded in 1964. I suppressed it to make the rest of the graph more readable. Did a quick rough look of HM results in the past year around the KC area. Used data from the two main timing companies in the area. This is based on finishers. One that I have never run (Hospital Hill) surprised me in that it was only 2650. I thought it was much larger. There were several that I ran a couple of years ago that had dramatic drop offs in entrants that dropped them a category this year (1700 to 790 in on case). The other thing this exercise showed me is that there are bunch of interesting looking small HM's around here that I had never heard of (trail HM in the dark, BBQ at the end, etc). Glad you enjoyed the data. You have a good point about my "huge" definition. I'll offer the feeble excuse that the Marine Corp by #s doesn't seem huge but it is in reality because it's combined with a 10K and 5K. The website makes contradictory statements about the number of runners and it's hard to know which are accurate because the website (very confusing, combining those 3 races together with the MCM marathon itself) doesn't even list the results of the 5K and 10K so I've no idea how many people really attend. Very interesting information. I like your breakdowns 'cept I am not sure about the Huge one. We have one here (Rock the Parkway) that caps around 5000. I have never had the feeling it is huge, it's just big. No need to quibble on that end of the spectrum though. Thanks for the data. Again it's very interesting. What's a small HM? Good question! 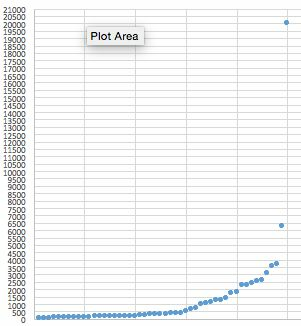 Here is a graph of the number of runners in all the HMs near me. The two biggest HMs (Rock'n'Roll, Marine Corps) make everything look small by comparison. So, for more detail, I made another graph without those two. I didn't bother to use 2000 vs 2001 because these are very squishy figures. It's really more of a gradient. I kinda feel like I failed your question, sorry. Feel free to propose a different scale! Topeka to Auburn (Kansas). Takes place in January (MLK weekend). Run over a bunch of hills in the country to include about three miles of gravel road. RD runs this which delays the awards ceremony until he has finished changing clothes. Pancakes and sausage at the end int he elementary school. Weather is always interesting. Seen snow, rain, dust devils and high wind. And that was just one race a couple of years ago. Love this HM. Lately a couple of hundred run it each year. Which brings up the question: What qualifies as a small HM? Here are a couple of stories. Feel free to share some of your own. 1) Bachman Valley - A small HM in Maryland: The RD shook every finisher's hand and congratulated each of us individually as we crossed the line. Loved that! 2) MD Heat - Another tiny Maryland race. I sprained my ankle a week before the race. Asked the RD if I could transfer my bib. I figured he'd say no but he allowed the transfer no charge, no fuss. Asked me if I'd be willing to volunteer. Of course, I happily said yes and had a great time doing it so we were both happy. I signed up again this year and he immediately emailed me, welcoming me back!